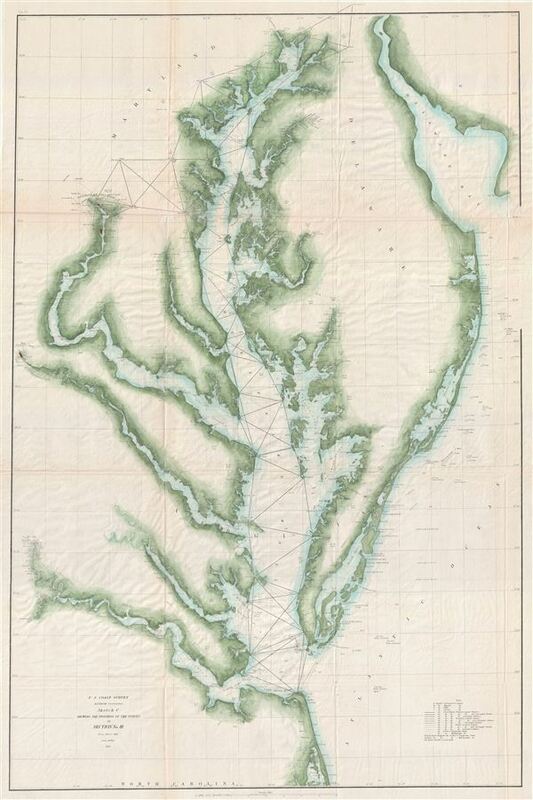 One of the rarest and most desirable U.S. Coast Survey maps of the Chesapeake Bay. Sketch C Showing the Progress of the Survey in Section No. III From 1842 to 1862. This is an exceptional example of the 1862 U.S. Coast Survey's progress chart of the Chesapeake Bay. The map covers from the mouth of the Susquehanna River southwards as far as Cape Henry and Norfolk. This chart includes both the Chesapeake Bay and Delaware Bay in full, as well as small portions of the Potomac River, Rappahannock River, York River, James River, Patapsco River, and Patuxent River. Washington D.C., Cape May, Charleston, Baltimore, Annapolis, Chestertown, easton, Cambridge and Norfolk, are identified. Triangulation points are noted throughout the region as well as all major islands, rivers, and inlets. Prepared under the supervision of A. D. Bache 1862 Superintendent's Report. Very good condition. Slight toning and wear on original fold lines - especially at fold intersections where there are minor verso reinforcements. Else an uncommonly clean example.